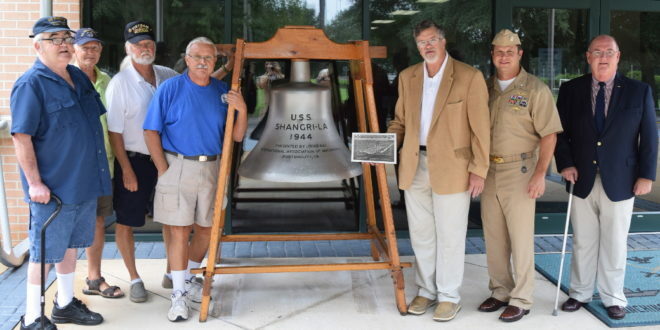 With the refurbished bell of the USS Shangri-La (CV-38), are, from left: Roderick Forrester; John Lanse; John Lyons; Al Miller; Bob Whitkop, Capt., USN (retired), JU’77; David Jasso, Cdr., USN; and Matt Tuohy, Capt, USN (retired), JU ‘75. 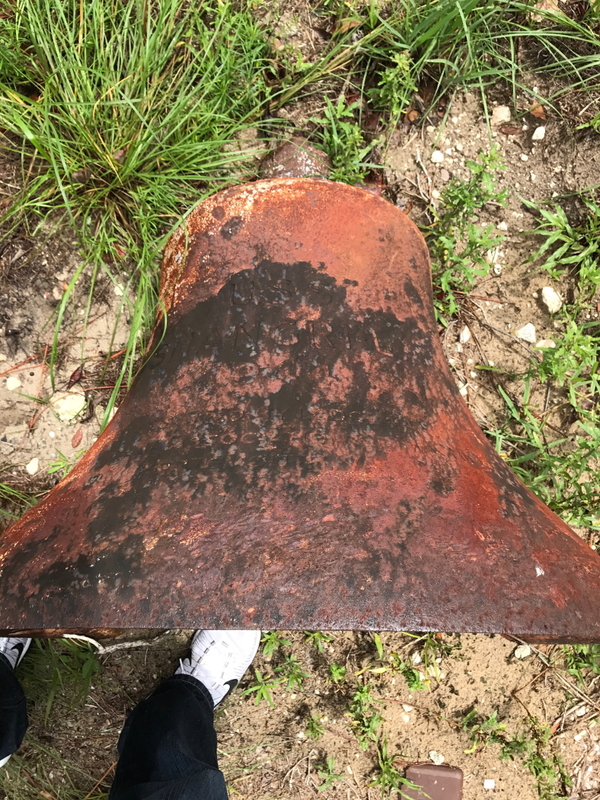 The University’s NROTC Unit is now home to the bell originally slated to ring on the deck of the famed World War II aircraft carrier USS Shangri-La (CV-38), but damaged in a fire and later found rusting in a farmer’s yard. 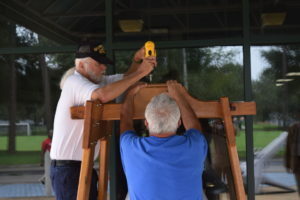 Al Miller (left) from the USS Shangri-La Reunion Group and Gunnery Sergeant Duane Smith (right) of the JUNROTC Unit work on securing the bell to its stand. 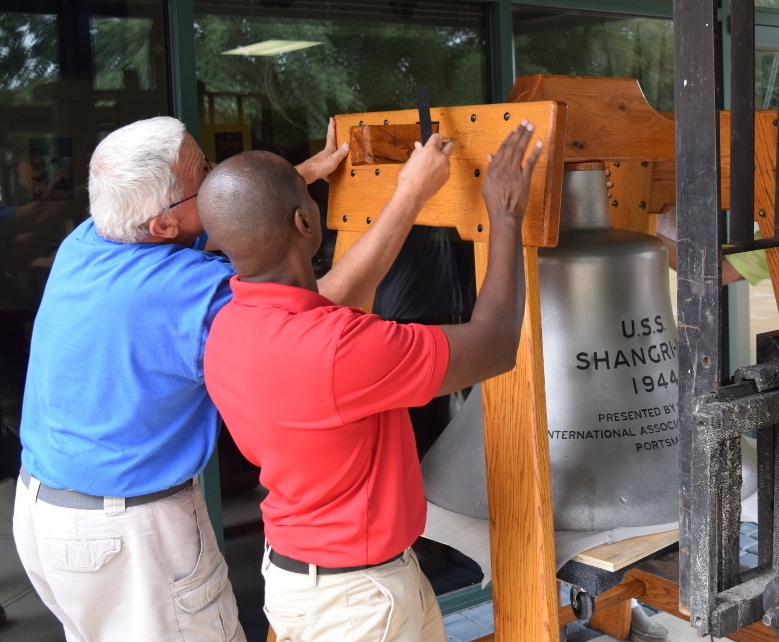 The ship’s Reunion Group and representatives from the Naval Order of the United States’ Florida First Coast Commandery came to the rescue and recently delivered the nearly half-ton refurbished bell as a permanent loan to the JU Naval Reserve Officer Training Corps. They helped JU staff hoist it to its display stand in front of the Tillie K. Fowler NROTC Building on North Campus. The USS Shangri-La was commissioned into Naval service on Sept. 15, 1944, during WWII. But before the bell could even be installed on the ship’s deck as it went into combat, it was in a warehouse fire, and because heat may have damaged it, the U.S. Navy cast a new bell for the carrier. The USS Shangri-La’s rusting bell as it was found in Hudson, Fla., before restoration. The Shangri-La and her attached air group then began launching their first combat missions in the Pacific theater, including the atom bomb testing conducted in Bikini Atoll in 1946 and various deployments around the world, from the Mediterranean to the Caribbean. Her final call to duty was during the Vietnam War, where she and her air group launched combat strikes into North Vietnam from Yankee Station. The USS Shangri-La started her career home-ported in San Diego and completed her service at Naval Station Mayport, from 1960-1971. She was decommissioned on July 30, 1971. The ship’s original bell fell into the hands of the USS Shangri-La Reunion Group by pure happenstance. Last June, a farmer from Hudson, Fla., spotted a man wearing a USS Shangri-La ball cap. They struck up a conversation, and the farmer said he had the USS Shangri-La’s bell lying in his yard on his farm, after his grandfather had got it from a salvage yard. Not wanting the bell to continue to weather and rust away, the USS Shangri-La Reunion Group got the wheels in motion to recover the bell from the field and begin restoration. USS Shangri-La Reunion Group members John Lyons (left) and Al Miller (right) secure the final piece onto the stand for their former ship’s bell. After two months of hard work, and more than 70 years after it was originally cast, the bell was back in pristine condition. The Reunion Group brought it to JU on Sept. 6, and with assistance from Physical Plant staff and a little elbow grease, it was put in place. Members of the JUNROTC say they are honored the unit was selected by the Reunion Group and Naval Order as the new home for the Shangri-La’s originally cast bell. They plan to host the USS Shangri-La Reunion Group in October 2018 so all its members get a chance to see the bell. As many as 75 former crew members may attend.